WILD [Walking Into a Land of Discovery] is all about adventure and imagination. WILD guests travel in cabin groups with their very own host to over 13 exciting arts and athletic activities throughout the week. Along the way, they make new friends, pick up new skills and discover new things about themselves in a safe, secure, non-competitive environment. Things get really WILD in the evenings with songs, skits, campfires and silly games. In the morning, WILD heads to Cabin Chat, a time where we invite our guests to explore what they believe. Then, they are off with their very own WILD host to arts and athletics skills. They will sample many of the activities Muskoka Woods has to offer. In the afternoon, WILD goes to the Camp Store and spends time as a cabin before heading to afternoon activities. 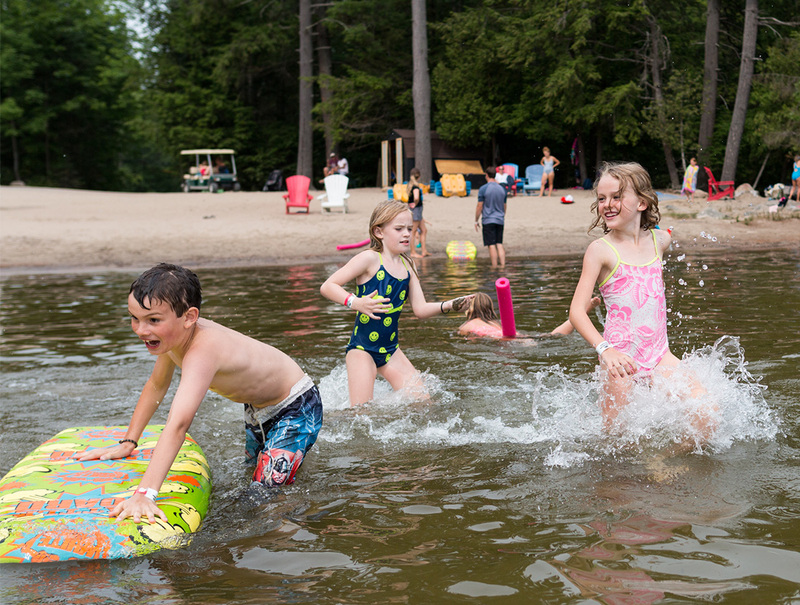 WILD goes to the beach everyday and has fun splashing in Lake Rosseau. At night, the fun only continues in evening program. This is always a memorable time full of laughter, friendships and maybe even some messiness! Every night, WILD guests join in a campfire and get a good night’s rest, so they can run WILD again the next day! Test Drive is a great opportunity for guests (and parents!) who are a little nervous about their first overnight camp experience. New WILD guests (born in 2011 – 2013), who haven’t been to Summer Camp at Muskoka Woods before, can register for Test Drive during Weeks 1-8. You’ll enjoy all the fun Muskoka Woods has to offer in 3 nights and 4 days. You will arrive on Saturday and savour every moment of our exciting activities, evening programs, Cabin Chats, and fun with new friends and counsellors until Tuesday evening at 5 p.m. Test drive is offered for $599 + tax. AND, if you decide you’re ready to take on the rest of the week, that’s even better! Just let your WILD Program Director know and they will call your parents to register you for the remainder of the week. Additional charges will be applied to your registration fees to equal the full cost of the week of camp.